When people think about gardening, many associates the planting season with spring. The early winter and early spring give growers plenty of time to grow seedlings, so they can be moved outside into the soil after the highly anticipated “last frost”. In the springtime, plants require the right air and soil temperature before they can be sown into the earth. Other plants need the longer days for maximum sun absorption. And while the spring is a wonderful season for Pittsburgh planting flower and veggie gardens, J Bird’s wants to let you in on a little secret: the fall is for planting too! Right around now you’re probably noticing a plethora of yellow, orange and deep red mums popping up at every store. Mums are the fall flower and can instantly transform your summer yard into a picturesque fall scene. They are very hardy and can typically serve as an accent to your fall landscape through Thanksgiving. The fall is also a great a great time to plant bulbs for your spring bloomers: crocuses, daffodils, lilies. Put bulbs in the ground now and watch them peak out of the melting snow come spring. Leafy plants like lettuce, kale, and spinach are very hardy leafy greens that will withstand the chill of the fall air and frost. Set aside a 4’ x 4’ area and toss some seeds into the ground while the soil is still warm. Add a cold frame or row cover to extend the garden’s life into the winter. 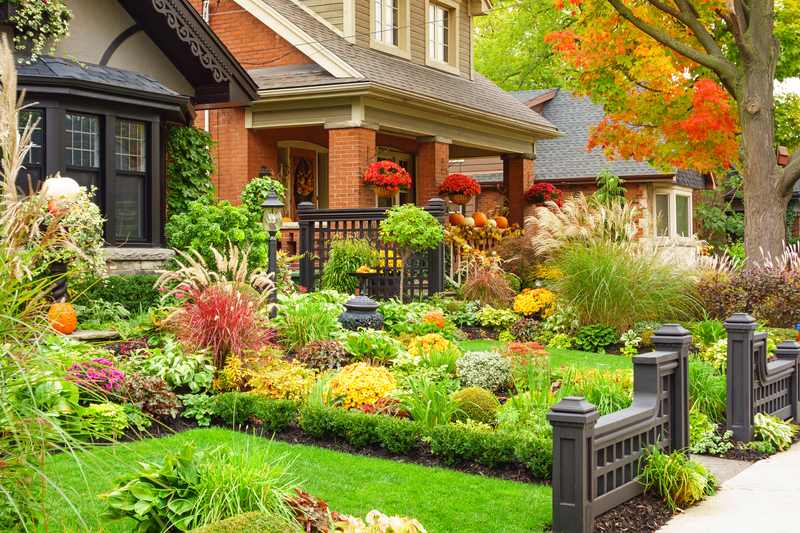 You can also add starter plants to your landscape borders, fall planters, and window boxes to fill in where summer annuals once grew. As you bid farewell to the weekly grass cutting, don’t forget to prepare your yard for the upcoming spring by fertilizing cool-season grasses like bluegrass and ryegrass in September and once again in late October or early November. This will create a lush green lawn after the snow melts. During the fall, nurseries and garden centers will sell trees and shrubs at awesome prices because they’re trying to clear out inventory before the Fraser Fir and White Spruces arrive late November. Take advantage of great deals and the warm soil and plant in the fall! Keep newly planted trees and shrubs well-watered until the ground freezes to establish a healthy root system. Soon after, they’ll go dormant till spring. While a painter may disagree, a skilled gardener knows when it comes to greens and browns, you get black gold. Soil, that is! Composting green (organic) matter and brown (carbon) matter, will create rich, nutrient-dense soil great gardening in the spring and summer. Green matter like grass clippings and garden veggie scraps, mixed with brown matter like leaves, hay and fire ashes create a soil gardeners call “black gold” because it can transform your garden when added during planting. Buy or build a compost bin and chop up the first batch of fallen leaves with a lawnmower or a chipper/shredder. Add a few of the carbon and organic matter mentioned above and turn the compost once or twice a month. While it typically takes a year for organic matter to fully decompose, you can speed up the process by chopping it up finely before adding it to your compost bin. Come spring, summer and fall you can add this rich, black soil to aid in the growth of your garden – naturally and nearly free! Note: Before adding glass clippings, consider if you’ve treated your lawn chemically before adding your compost. Call J Bird’s Landscaping and Excavating for all your planting, excavating and landscaping needs! And always check back for advice on caring for your lawn and garden. For a free quote, call 412-224-0639!